Bethlehem Steel announced on Thursday that the club and goalkeeper Samir Badr have mutually agreed to part ways. Bethlehem Steel announced Badr’s acquisition from fellow USL side Colorado Springs Switchbacks on January 8, 2016. Badr played ten games with Bethlehem in 2016, allowing 16 goals over 900 minutes of play while making 35 saves for a save percentage of .686 and a goals allowed average of 1.60. Badr’s departure leaves recent acquisition Matthew Perrella as the only goalkeeper on Bethlehem’s roster with three games remaining in the regular season. Born in Fairfax, Virginia, Badr joined the DC United youth system in 2007 before opting out of college to join FC Porto’s academy in Portugal in 2008. Badr joined Portuguese second division side Vizela in 2012 and was later loaned to Egyptian Premier League side El-Hodood. In 2014, Badr returned to the US to sign with USL side Oklahoma City Energy, making 13 appearances. 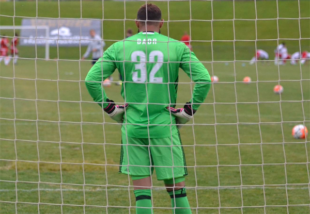 Released after the 2014 season, Badr signed with Colorado Springs in 2015 where he made seven appearances. A former US youth international, Badr earned three caps with the US U-20 MNT in 2010. Seems strange that this happens now when the season is almost over, some personal issues between players or staff? I would think he wants more playing time as he keeps getting pushed aside for players from the Union, but this is just a guess. Possibly opportunity has knocked elsewhere? Not necessarily in this country? Coach Burke has promised to reveal his secret emergency back-up goalkeeper after the season is over. In the meantime, for the remaining home games the prize for the 50/50 Raffle is a one-day contract with Steel and a pair of goalie gloves.